Product prices and availability are accurate as of 2019-03-04 04:19:18 UTC and are subject to change. Any price and availability information displayed on http://www.amazon.com/ at the time of purchase will apply to the purchase of this product. Perfect for pajama parties and travel, Disney Frozen Rest Carry with Pillow consists of all the needs for an night away. The slumber set consists of a sleeping bag, pillow, and carry lug. 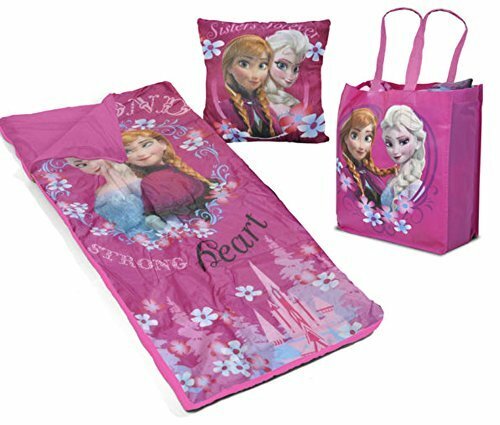 All items include modern-day graphics of Anna and Elsa from Disney's Frozen. The lug is canvas and reuseable - great for bring clothing, toys, as well as Mama's groceries! The pillow is 12" x 12", and it is 100 % polyester. The resting bag is 30" x 54". The outer shell is nylon with poly filling.